Bottom of the IPL points table after eight matches; seven convincing losses and one unconvincing victory; a group of players that seemingly have no idea how to handle the pressure on the field. Royal Challengers Bangalore have had a torrid start to IPL 2019, and their exit from playoff contention is all but confirmed with just six more matches to play. The script for RCB looks similar to last year - a strong batting unit with two of the best batsmen of the modern era, a good Indian fast bowling unit, a decent international middle order and a world class leg spinner. And yet, arguably one of the best teams on paper are the worst team on the field, two years in a row. There have always been doubts over the abilities of Captain Virat Kohli, but the batsman Kohli has always made sure that any flawed decision taken on the field is rectified by the runs he scores. But the runs are not flowing as freely this IPL season, and hence the flaws are looking larger. A captain's role is to induce confidence in the players on the field. We have seen Sourav Ganguly doing that very well, protecting his players with his life, and showing very less disappointment or aggression if a fielder misses a catch or a bowler bowls a bad ball. Ganguly saved all his aggression for the opponents. MS Dhoni also mastered the art of bringing the best out of his players. For instance, Deepak Chahar has played the role of leading the CSK fast bowling unit with panache, as Dhoni has kept giving him confidence. Then why is Umesh Yadav, a Team India regular, struggling to put up a decent performance, let alone a match-winning one, for RCB? A captain's role is to play the best XI keeping the conditions in mind, and there too Kohli has come a cropper. It is baffling how Akshdeep Nath gets games with Heinrich Klaasen sitting out, when only three international players are in the team. Thankfully the IPL is a domestic league with very little at stake. Thankfully, Kohli will have the advisory services of MS Dhoni and Rohit Sharma, if needed, for the upcoming World Cup. But the concern for a fan of Indian cricket is not just the World Cup, but also the future after it. Once the calm head of Dhoni retires, will the Indian team look as organized as they are now? Is captain Kohli really in charge of the team, or is he just the face of Indian cricket? 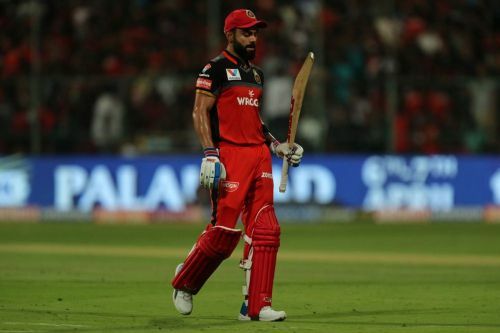 IPL 2019: Is it time for Virat Kohli to let go of the RCB captaincy? Can Royal Challengers Bangalore's poor form dent India's World Cup hopes?